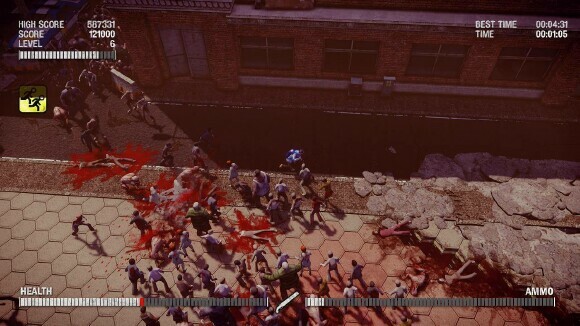 Hey all, its JDL back with another fun "Xbox Live Downloadable" title review; this time around, I'm going one-on-one with #killallzombies, which I feel is appropriate given my past experience as a professional zombie (no, really). 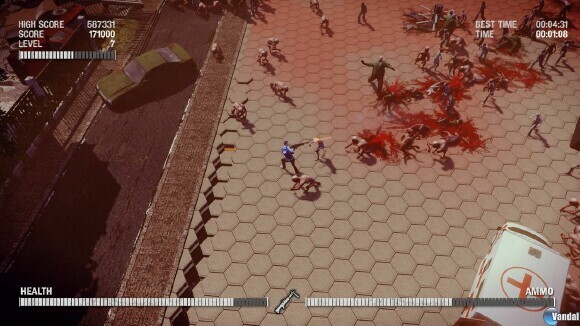 #killallzombies is a dual-stick shooter set 10 or 20 minutes into the future, featuring a single, oddly dressed player against unforgiving, unrelenting, fairly spry zombie hordes for the sake of a TV show (although this isn't mentioned anywhere but the Xbox Store). The zombies’ mobility isn't quite on the level of the zombies from 28 Days Later, but it's much faster than the average shambler, they move at a pace I'd describe as a stalking jog. Unfortunately, there's more than just zombies/zeds/walkers/whatever you'll call them that aren’t the only things trying to kill players. Besides zombies, there's also zombie dogs that chase you and are just as dangerous if not more so than their humanoid counterparts. Anyone who's ever played a Resident Evil game from before the year 2002 knows how difficult undead quadrupeds can be. 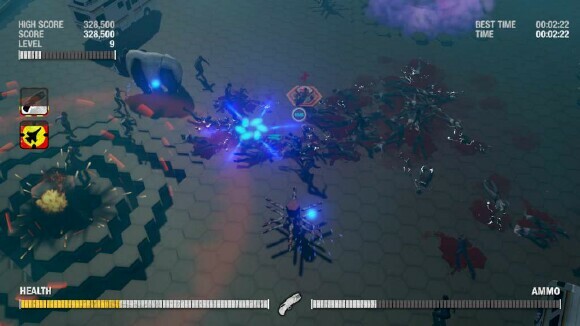 Players also need to beware spinning blades that jut out of the ground at random (they're like nail bats that move in a spiral), however, the nail bats/saws can be used against the zombies and the dogs with careful timing and planning. The stadium, where the game show takes place, features shifting tiles that can change in height, either creating walls or pitfalls for both the player and the oncoming horde. 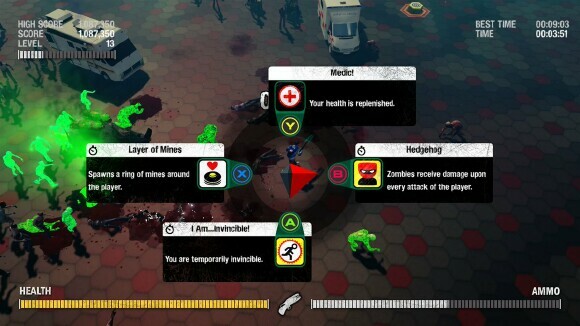 Thanks to the "perk system", which I'll get into shortly, the player can also control the tiles to summon waves that kill zombies, create barriers to keep zombies out or create rings to trap them, allowing you to pick them off one by one. You can even use the gaps as cover. Thanks to the ever-changing tiles, it'll help keep things fresh and no two playthroughs will ever be exactly the same. Another hazard that keeps the experience from getting stale are the airborne obstacles the player will have to mind. While the obstacles (which can range from RVs, tanks, Thor's Hammer, or cartoonish looking anvils) can be detrimental to the player, they're also a hazard to the zombies, just like the nailbat-saws. 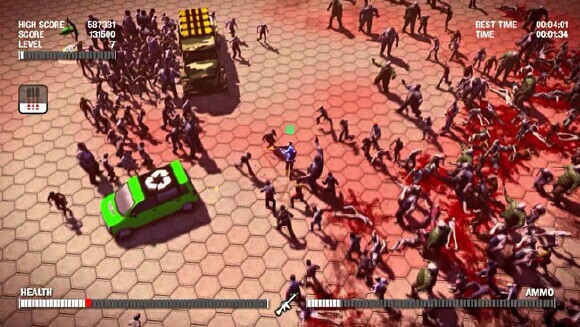 Players will be alerted to the incoming obstacles by a silhouette that'll let them know where the crash zone is and where to try and guide the zombies towards. In addition to all of the aforementioned dangers, players must also beware... of humans? Just like in "The Walking Dead", humans are the real monsters and this game is no different. If a player broadcasts their run via Twitch, viewers can vote to drastically change the player's experience. It sounds strange, but it's true: the viewers and their votes can spell certain doom for the player if the spectators are feeling malevolent. So where's the reprieve? Where's the fighting chance? 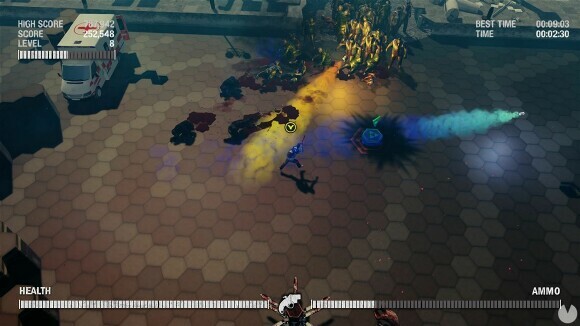 Well, players can rely on a handful of perks that are divided into four categories: active, passive, timed and temporary, which are obtained upon leveling up and chosen at random. 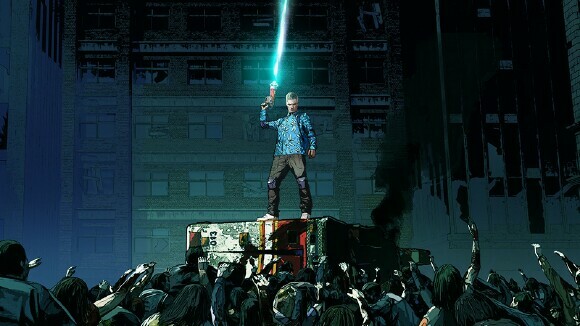 Some perks grant you access to weapons or temporary invincibility, while others permanently improve or change your existing abilities and parameters like a traditional perk. My personal favorite lets you ignore damage, at the expense of having a 10% chance of dying instantly when touched - definitely a fun trade-off! In fact, during one playthrough I combined that perk with another that gave me a 90% chance to dodge, a perk that granted me a free revival and a perk that gave me 500,000 experience points at the cost of dying. When all was said and done, I basically traded my free revival for more experience (and thereby more perks and weapons) and was still untouchable due to the 90% dodge rate and 10% chance to die that I retained. A 10% chance of getting hit + a 10% chance of that hit killing my character results in a 1% chance to die from any and every hit. A fighting chance? If players can get creative (and just a little lucky) they'll be rewarded with nigh-immortality. 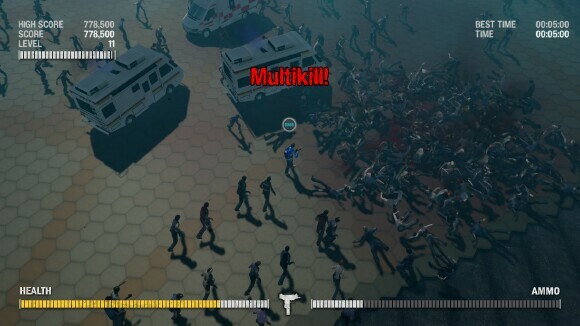 If I'm forced to criticize anything about #killallzombies, it'd be the manner in which the perks are assigned; while the perks and the weapons feel varied and numerous, I really wish there was a way to pick the perks I wanted off of a list or at least a separate mode for random perks and a separate mode for choosing perks that you want specifically. Also, there are a metric buttload of weapons available to the player (from assault rifles to laser guns to RAINBOWS), but I'd like there to be a better selection of starting weapons, especially for beginners. As someone who prefers automatic weapons in shooting games, I would've really liked an Uzi, personally. Those two things aside, I can't really complain about #killallzombies! 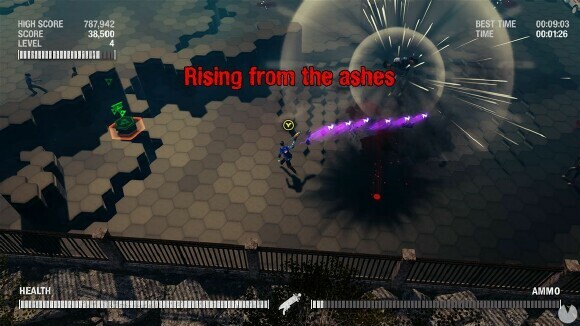 #killallzombies is a fun dual-stick shooter with simple, easy to learn, pick up and play controls. Players can get really creative with the perk system, provided they can stay alive long enough to rack those perks up. With Twitch support (or damnation) and the constantly changing arenas and perilous traps, players will be on their toes at all times as they're rushed by zombies over and over again without mercy. And out of TOV 5 stars, I’m giving #killallzombies a 4.